Cairngorm Golf Breaks. Boat of Garten - The Boat of Garten Golf Course, designed by the legendary James Braid, is known to local and international visitors alike as "the jewel in the crown" of Highland golf. "The Boat" is not only a demanding test of sporting skill but also a magnificent scenic setting with the Cairngorm mountains providing a spectacular backdrop. 18 holes. Par 70. 5,967 yds. Parkland. Hilton Coylumbridge. . . Invernesshire, Aviemore, Aviemore PH22 1QN, Scotland. The leading resort hotel in the Highlands, set in a 65 acre woodland estate in the heart of the Cairngorm National Park. The Cairngorm Conference and banqueting suite holds 800 guests, making it one of Scotlands premier venues for corporate events. The facilities at Hilton Coylumbridge are exceptional for the entire family, with 2 indoor swimming pools, sauna, solarium, tennis courts, and an outdoor adventure play area. The onsite 'Fun House' is packed with activities for everyone including Mini Golf, 10-pin Bowlingo, a soft play area and a creche. The hotel also offers nightly entertainment. 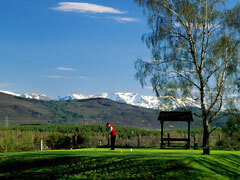 Cairngorms Golf Breaks.